Students were greeted by music, games, and a lot of information from more than 20 clubs during Club Rush at the main quad on Tuesday. The event encouraged students to become more involved and active on campus and ran from 10 a.m. to 2 p.m.
One of the clubs present was the Photo Club. Member Laura Martinez said the club is open to those who would like to learn more about photography. The Photo Club holds workshops for amateur photographers with little to no experience. Members with more experience will get to improve their work and have a chance to get it displayed in the Los Angeles County Museum of Art . Another club in attendance was the Rhythm Club. Like the Photo Club, the Rhythm Club does not require you to be a professional to join. They do, however, encourage those who do know how to play an instrument to sign up. Member Uriel Jimenez said the club plays concerts and at sports games, mainly basketball and football. Jimenez said the Rhythm Club likes to support the Husky athletes by playing music. Those who would like to learn to play certain instruments can be taught by other willing club members. Besides arts clubs, students were also able to meet clubs that are involved in the community. Both the Child, Family, Education, Studies Club (CFES) and Dream Weavers Club encourage members to help families and youth in need or distress. These service clubs call for members to get active in not just their school, but their community as well. The CFES Club is for students who want to work with children and are interested in helping the community. Club member Saira Espinoza said that the club does a lot of fundraising and advocating for families. Dream Weavers member Jaci Cortez said students do not necessarily have to be current or former foster youths themselves; they just need to be passionate about wanting to support foster youth. From finding books for classes to offering a scholarship up to $500 for active club members, Cortez said the Dream Weavers try to support their members in different ways. They volunteer at group homes and help give members experiences they were unable to receive. The club also takes members ice skating, on university tours, and visits to the beach. The Associated Student Union (ASU) encourages students to join and get involved in the many clubs on campus. Members of the ASU receive free items, discounts, and access to ASU scholarships and parking structures. The fee to hold ASU membership every semester is $7 in the Fall and Spring and $3 for the Winter and Summer sessions. 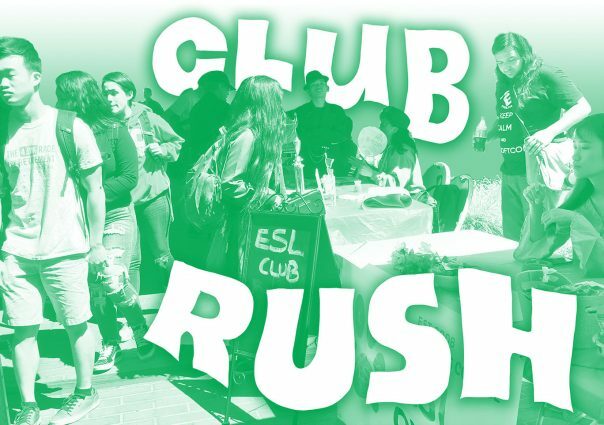 Club Rush will continue through tomorrow from 10 a.m. to 2 p.m.
A DJ was present to entertain and boost student interest with music throughout the event. The ASU attracted passerbys with a prize wheel. Many of the club booths offered snacks, candy, entertainment, and water to students.